Until 2001 my working life was mostly as an employee. I received a W-2 for my work at the end of the year. This meant that Social Security and Medicare taxes were automatically taken out of my paychecks, and there was no opportunity to resist those taxes. It’s possible to adjust allowances for federal income taxes on a W-4 form and stop federal tax withholding, but it is not possible to stop what also appears as “FICA” (Federal Insurance Contributions Act) on the paycheck, because Social Security and Medicare taxes are set percentages. When I shifted to mostly self-employment after 2001, I could make the choice about whether or not to file quarterly and whether or not to pay into Social Security. Because I had more than three decades of employment, qualifying for Social Security when I reach retirement age was not an issue. You need 40 quarters or about 10 years of employment. Social Security earnings statements are based on reported earnings (by your employer or yourself if self-employed), not what you pay in. I had been “in the system” for many years before I became a war tax resister in my 30s, so I was in the habit of filing and have continued to file even as I resist federal income taxes. Social Security (self-employment tax) is a separate line on the 1040. For me the focus has always been to protest the federal income tax. The individual income tax remains the greatest source of federal revenue that is divided up for federal spending such as education, health and human services, and the military, and the issue of half of that going to the military was what got me into war tax resistance in the first place. I have always supported some kind of guaranteed income for people in need, which in this country during my lifetime has only been guaranteed to retirees through Social Security. As far as I can tell it is a system that has worked pretty well — though for many people it is still more like guaranteed poverty than a livable income. I would like to see the Social Security system survive and provide a higher payment for people who do not have additional retirement funds to supplement their monthly check. There is much that needs to be done to offer the not-wealthy elderly decent food, clothing, and shelter. I write my money order to “Social Security Administration,” but it gets sent to the IRS, and I am aware that the actual dollars that I pay are probably tainted. It is still the practice that bookkeeping accounts for Social Security payments to the Trust Fund even as the government throws all the money together. As a war tax resister I wanted to show support for an important federal program while making my protest of war through income tax resistance. 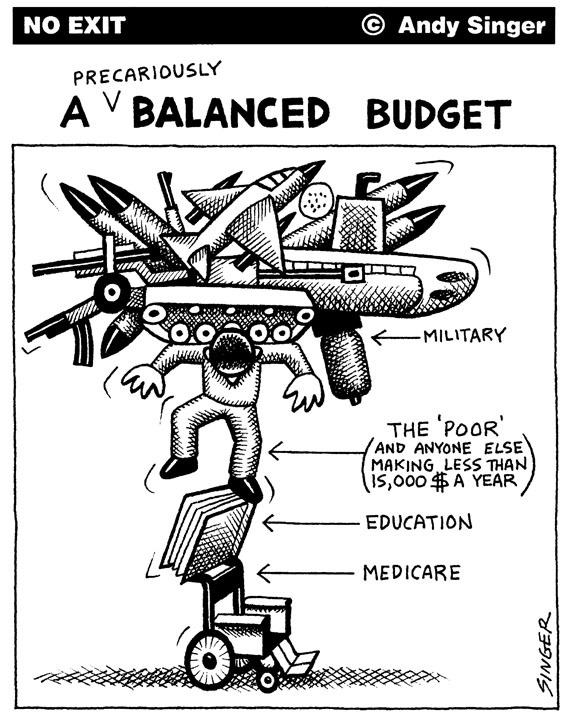 I hate to see Congress and the administration demanding cuts to programs that benefit many people in need because they have run up budget deficits for their wars. My demand is that they stop comingling Social Security money with the general fund and make caring for people a higher priority than killing people. When I started my tax resistance in 2003, I resisted the federal income tax but continued to pay the self-employment tax, or SECA (which, along with the payroll tax, or FICA, is what is commonly called the “social security tax”). A few years later I began resisting that tax as well because when I looked at how the government actually spends our money, I saw little meaningful distinction between the two. Congress has taken the money it raises through SECA/FICA and has spent it on the military, and it has also taken money from the general fund to pay Social Security and Medicare benefits (for instance in recent years when the government temporarily lowered the SECA/FICA tax rate as a stimulus measure). To Congress, it’s all one big pile of money, and it’s only their collective whim that decides where any particular dollar of it goes. The idea that the money raised through SECA/FICA is spent only for a benign social safety net turns out, alas, to be a fiction. SECA/FICA is a war tax just as much as the federal income tax or the telephone excise tax. If we are war tax resisters because we conscientiously object to paying for war and militarism, it is important that we not be fooled by the name that the politicians give the tax, but that we follow the money and see what it funds. There is another pernicious effect of considering SECA/FICA to be insulated and distinct from the rest of the government’s taxing-and-spending: SECA/FICA is a regressive tax. It hits the poor harder than the rich by not taxing interest and capital gains and by not taxing any income above a certain threshold. When you consider SECA/FICA to be just a particularly regressive component of the income tax, as I think you should, you are better equipped to combat the familiar talking points about the income tax system being rigged against the wealthy. Most American households pay more SECA/FICA than federal income tax. About 37% of them pay no federal income tax at all — do we want to send them the message that war taxes are not an issue for them? that they don’t have to worry about paying for war with their taxes? Some of our outreach material (including, unfortunately, the useful and popular WRL pie chart flyers) reinforces the idea that there is some sort of firewall between SECA/FICA and the rest of the taxes that fund the government. I think we might want to reconsider this, as it is misleading and may be harmful to our cause. When my father died in 1955 we never got any Social Security since farmers at that time (or before that) could choose to pay or not. He may have paid a little, but didn’t have enough (or any) credits toward us getting any help. Amish church members have an exemption to paying — or receiving — Social Security since they care for their own people. Seems like anyone in a large enough community like Catholic Worker could get along without these benefits. I’ve always been willing to pay for Social Security and Medicare and hope that the laws for it don’t get changed too much. Medicare has been a blessing for me since I’ve only had paid benefits from working at a job in the U.S. for six years. Like Ruth, I object to Congress borrowing money from the trust funds, illegally and immorally, to fund the war budget. A couple times when we as a family owed income tax, I’d write the check to Social Security. It was basically a symbolic gesture, however, I felt okay about it. I’ve never had to pay estimated quarterly taxes. Low income people don’t get taxed on Social Security benefits. I began employment in the late 1960s. I paid Social Security taxes for about the equivalent of seven years before I started refusing the federal income tax, beginning in 1978. I began to recognize the relationship between what I gave money to and what I believed were good, and bad, uses of that money. Since then, I have been self-employed, never an employee. Because of the connection between income taxes and the feds’ “borrowing” of money from the Social Security system to pay for wars, I also decided not to pay the SECA taxes. There are a lot of zeros on my Social Security status report. However, beginning in about 2000, I decided to pay into the system, at least enough to finish the twelve quarters/three years that would allow me to get something back from the system. This was no philosophical change of heart, just a desire to get back some of what I had given to the government. It was also a practical concern of having enough money for myself and my partner to live on in later years. WTR Juanita Nelson talked about how we can all provide “social” security to each other by giving of ourselves and our time when our friends need that. She and Wally didn’t pay into Social Security and had gotten support when in their 80s and 90s. While I subscribe to that concept, I’m not as beloved and not sure if I would get that kind of support in the very rural place where I live. I decided to hedge my bets with this backup system, which should start in about two years. So, I filed and paid SECA taxes for three years. I was making just under a taxable income, so that was the only tax I owed. Because the U.S. was fighting wars during some of those years, I purposely paid only half of the SECA taxes due. For several years, I couldn’t even bring myself to file and pay anything. I get bills from the IRS for the other half of the self-employment taxes, which I expect will be deducted from my Social Security when I start getting it in about two years. I try to act out of belief in doing what I’m doing, but, in this case, I acted out of insecurity. If others can act on their feelings about war and violence rather than their need for financial security, so much the better. Ruth Benn lives in Brooklyn and is NWTRCC’s Coordinator. David Gross lives in California and blogs at sniggle.net/TPL. Susan Miller is active with Heartland Peace Tax Group in Kansas. Larry Dansinger coordinates the Maine WTR Resource Center, among other things.